Two recent bites at a bear zoo have renewed calls for the zoo’s closure. The zoo is the Chief Saunooke Bear Park, which stands on land owned by the Cherokee Indians in North Carolina. These two most recent incidents included a nine-year-old girl being bitten on her wrist while trying to feed a bear cub a mixture of Lucky Charms cereal and cat food. A federal inspector witnessed that biting last month. The USDA issued a report mandating the addition of safety features to the zoo. Animal rights groups have called for the zoo to close altogether for the sake of the animals. This particular zoo has been cited multiple times in the past, and the situation has even earned a visit from Bob Barker. The game show host and cultural icon visited this particular zoo last summer to ask Chief Michell Hicks to close the zoos. Chief Hicks not only declined to close the zoos, but threatened to ban the activists from the property. Visitors to the zoo are not the only ones who have been injured at the park. One of the park’s managers was wounded last December while giving water to a bear. While animal attacks against humans are not necessarily commonplace at zoos and animal parks, when they happen they are a startling reminder that humans and wild animals do not belong in the same place. Bears are enormous animals that are used to freedom of movement. 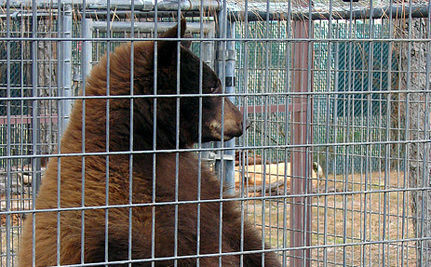 There is no excuse for confining a bear or any other animal in a concrete and steel pen to be entertainment for humans. Animals do not exist for our entertainment anymore than they exist for our consumption. Confining wild animals in zoos is not only antithetical to their very nature, it is cruel and psychological torture. Caging a wild animal is not only unethical, it is dangerous for the humans who inevitably have to handle those animals. There are groups calling for a boycott of the zoo and the revocation of its license to exhibit animals. I would take it one step further and urge you to boycott all zoos and work for the revocation of all zoo licenses. Animals belong in the wild, not behind a chain link fence. Bear zoos are inhumane and cruel. They should be shut down. All zoos should be shut down, in fact. Release the bears back in the wild where they belong. Quit caging wild animals. Zoo's should be about preservation, but Greed gets to them. zoos should be banned from the world. i wouldn't even bother going to one or wasting my money on one. I am one-eighth Cherokee and have always been very proud of that heritage. Now I am ashamed. To have so many glaring violations and still be able to remain open is puzzling to me!!! Shut the zoo down and fine the individuals responsible for this debacle!!! !